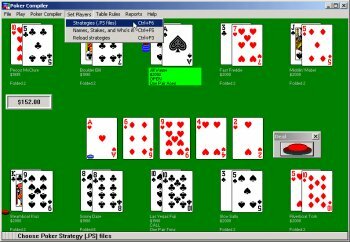 Poker Compiler Texas Holdem lets you play or analyze poker. The computer players` actions are completely controlled by scripts that you can read or modify. The scripts mimic poker: `if HasFullHouse then raise.` Set betting limits and other table rules to match live games. Five report screens tell you how well you are playing. Rig the game to practice particular hands. Use high-speed AutoDeal to see which hands win or lose in the long run.